The exploration of MODX Super Knob programming continues with Super Knob Unipolar settings. The next two PERFORMANCE examples show the assignment of a Part's parameters to the Super Knob, which are a bit more complex than using Common parameters. (Please note: The Live Set that is used in the Mastering MODX series is located here). Our first step in exploring these basic setups is looking at how the Knob within a Part can be linked to a Knob that is controlled by the Super Knob. As you get to see how this works, you’ll begin to understand how one movement can be farmed out to several different locations, in differing control amounts. We’ll see how the Part Assignable Knob 1 is linked to the Common Assignable Knob 1. We will, again, navigate to the upper level of editing (Common/Audio) and take a look at the assignment. 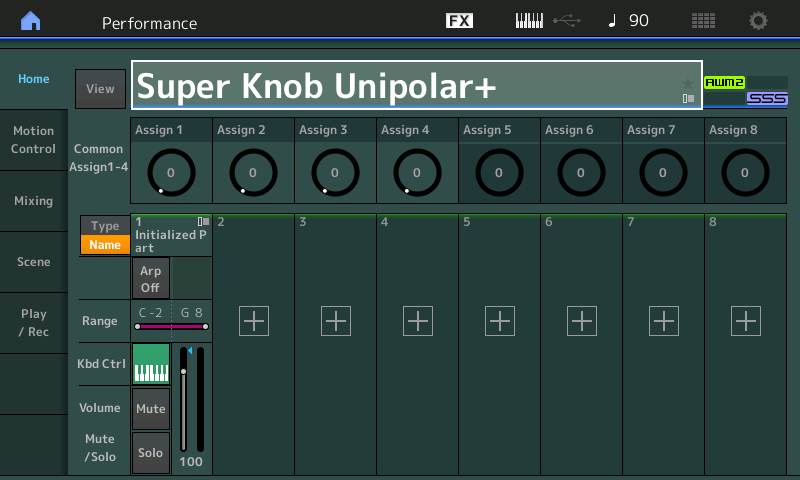 This highlights the PERFORMANCE NAME: "Super Knob Unipolar+". “Common” appears in a blue in the lower left corner. In the screen select "Control" (left column of the screen) > "Control Assign" (second column). Make sure the AUTO SELECT option is active (green). This is linked to SUPER KNOB movement. The upper Common level has 8 Assign Knobs which, we know, are linked to the Super Knob. The first of these, Assign Knob 1, is controlling "Destination 1 = Part 1 Assign 1" (Part 1's Assignable Knob 1). Translation: the first COMMON assignable destination (Destination 1) for this Performance concerns the program occupying PART 1. This assignment gives the Super Knob control over Part 1's Assignable Knob 1. To see exactly what "PART 1 Assign 1" is controlling, we simply follow this screen. Remember, if we think about the playable Performance as having 72 Assignable Knobs (Common has 8 Knobs, and each of the 8 possible Parts can have 8 Assignable Knobs...) - we are assigning the Super Knob to control a parameter within PART 1. We do so by linking Part 1's Assign Knob #1 here. Touch the box “Edit Part 1 Control Settings” this will take you directly to the Part 1 “Mod/Control” > “Control Assign” screen. Again the top line of the screen and the lower left corner will indicate where you are within the architecture. In this simple example, you can turn Assign Knob 1 directly, and view its controller box - and if you turn the Super Knob the “Display Filter” will show the same parameter assignment (as we have only linked this one thing to the Super Knob). Please observe the control range when you move Assign Knob 1 from minimum-to-maximum, and that this starts out as the same range when you move the Super Knob, minimum-to-maximum - they both control the same range. Observe how the Super Knob controls the movement of Assign Knob 1, but Assign Knob 1 can be moved directly and independent of the Super Knob. You can imagine that the Super Knob can be linked to other PARTS and other functions (we are just looking at one). Hint: to understand the two “Common” selections, you must realize that a playable PERFORMANCE can have 8 KBD CTRL PARTS; together they share the PERFORMANCE NAME, the SYSTEM EFFECTS, the MASTER EFFECTS, the MASTER EQ, and they include the AUDIO IN settings. Each PART, however, is a like a complete Motif XF level VOICE with 8 Elements and each with its own Part COMMON parameters. Or a PART can be an FM-X creation with 8 Operators. Each Part has its own Name, its own Insertion Effects, and its own 8 Assignable Knobs! So, if you think of each PART as a separate synthesizer, with its own complete set of parameters, what we are doing is linking control of this ‘synthesizer’ with a, well, you know, a "SUPER KNOB". A single KNOB that when moved can send a different message out to each as it treats each as a separate synthesizer. It takes a minute or two to let this sink in. But it is as if we are dealing with a large 'modular' synth; where a Keyboard Controlled program (with 8 complete) synthesizers is linked to this MOTION CONTROL ENGINE. And like patching cables in an old-style analog synth, we are linking controls, and later we'll see how we can fine tune the control range of scores of controllers. It is quite fascinating when you get a glimpse of the whole thing! Once you select a PART you can move around within it: Select "MOD/CONTROL" (left column of the screen) > "Control Assign". The Controller setting is Unipolar with Ratio +32 (giving a linear response - shown above). With the AUTO SELECT highlighted, you can turn Assignable Knob 1 and view the assigned Destination = InsA LfoSpd. This happens to be the LFO Speed of the CLASSIC FLANGER assigned to PART 1 (and only PART 1). Press [EFFECT] (second item left side of the screen to view the Effect) > select "Routing" for PART 1. INSERT A is the Classic Flanger. You can drop into edit the Effect parameters by touching "INS A" in the second column. The LFO Speed of the Classic Flanger is set to a minimum level in the Part Effect window (shown below). The Super Knob position 0 (left) is the start position. It corresponds to the parameter setting of LFO Speed = 0.00Hz. The Super Knob moved from left to right controls the complete parameter range from LFO Speed 0.00Hz to 39.7Hz. [Note: We often get questions as to why the values do not animate in the MODX screen when the Super Knob is moved. The Super Knob can be in control of more than one hundred parameters – beside it is not necessary – when you move the MW or PB or FC, you do not expect to see the value of the movement appear anywhere). You can clearly hear the Speed change as you move the Super Knob. The potential here is tremendous as one KNOB can be assigned to do multiple things with different ranges for different areas of the PERFORMANCE]. Summary: At the upper COMMON (overall) level of the architecture, we have assigned Super Knob control over PART 1's Assign 1 Knob. This is done by linking the "PART 1 ASSIGN 1" to the Super Knob, whatever parameter is selected for this knob to control will be influenced by the Super Knob. The "DESTINATION 1" within PART 1 indicates that this is the first controller assignment for PART 1. There is a maximum of 16 Source/Destinations per PART. In this example, the LFO SPEED of the Classic Flanger is the selected parameter within PART 1. We must state again, we are limiting ourselves to a single Part Performance in this case. Each additional PART added under Keyboard Control will have the same opportunities to be programmed with their own set of 8 Assignable Knobs, and destination parameters. The assignment we make for Part 1 will only apply to Part 1; the Classic Flanger is an Insertion Effect and belongs only to this Part, Part 1. This next example shows the modulation of the LFO Speed in opposite direction (negative). This is achieved here by starting the Classic Flanger at its highest Speed (39.7Hz), and by selecting the Polarity as a NEGATIVE value, so that applying the same movement reduces the LFO SPEED from Maximum-to-Minimum. The Classic Flanger LFO Speed is set to the maximum level in the Part Effect window: 39.7Hz. The Part Controller setting is Unipolar with Ratio -32. Select "Mod/Control" > "Control Assign"
The Super Knob position 0 (left) is the start position. It corresponds to the parameter setting of LFO Speed at maximum = 39.7Hz. The Super Knob moved from left to right controls the complete parameter range in reversed order from LFO Speed 39.7Hz to 0.00Hz. Turning the Super Knob up, actually decreases the Speed. In this example, the COMMON ASSIGN KNOB 1 has been tasked with controlling PART 1's Assign Knob 1. PART 1's ASSIGN KNOB 1 is set to control the Part 1 INSERTION EFFECT "A" parameter (LFO SPEED). Touch the parameter contained within the "DESTINATION 1" box, to reveal the list of potential assignment destinations that can be selected. There are a ton of potential options. More than you might first think. Use the DATA DIAL to explore the options. In this particular example, by selecting PART 1 > PART 1 Assign 1 we are linking PART 1's first knob with the Super Knob. The potential Destinations will give you an idea of the depth of the engine. These are the parameters available via the upper overall "COMMON/Audio" level of the program. When you see the top line indicate "EDIT - Common/Audio" you are able to assign these parameters to the Super Knob. The INSERT A and B referred to here are those dedicated to the A/D (Audio) INPUT PART. It now, like every other KBD CTRL PART, has its own Dual Insertion Effect. The A/D INPUT is grouped with the COMMON overall parameters. This is why this level of the architecture is referred to as "Common/Audio". If you select an Ins A or B (A/D Part), the Reverb, the Variation, or the Master Effect each can have as many as 24 potential parameter destinations (the actually number of available parameters will vary depending on the effect TYPE currently active in the processor). When an Effect Type is assigned to the processor, automatically the parameter names that are available to be controlled will appear on this list. Those parameters that are not available for real time control, will not appear. (Only parameters that are deemed musically useful are available for real time control). If you select the "AD Param" you can control Volume, Rev Send, and Variation Send amounts of an incoming analog signal. (This is new!!! A very common Motif XS/XF request was to be able to control the AD PART with an assignable controller). These are followed by each of the 16 MODX synth PARTS which each have 8 assignable knob destinations. [Wow!] That's 128 Assignable Knobs plus the 8 for the Common/Audio level. As we'll learn, Parts 1-8 can be linked with the Super Knob, but every Part has its own 8 Assignable Knobs for when that Part is individually selected (highlighted). Press the "X" in the screen to exit or press [ENTER] to make a selection assignment. If you touch the "DISPLAY FILTER" box, you can see all of the assignable devices. Changing the Display Filter does not change anything but what you are currently viewing. Overview shortcut: Again, let's practice navigating using the available shortcuts. Recall the PERFORMANCE and touch the HOME icon. Notice in the PART box, "PART 1" is selected and in the diagram a highlight box also appears around the number "1". The Part Assign Knob 1 is linked to PART 1 (green line); which is under control of the Super Knob (blue line); Notice you can drop from here directly to "Edit Part 1 Control Settings" from this information screen. This shortcut will take you directly to the Part 1 Mod/Control > Control Assign screen. If you then activate the AUTO SELECT box, touching/moving a controller will display its assignment. Or simply set the "Display Filter" = ALL to view all assignments for the currently selected PART. Important Note: Parameter Destinations for the COMMON/Audio level of the PERFORMANCE are different from the available parameter Destinations for an individual synth PART. The INSERT EFFECT A and B that appear among the COMMON/Audio Destinations refer to the A/D INPUT (AUDIO IN) PART; While the INSERT A and B that appear among the synth PART parameter Destinations are those applied to this particular PART. If you have any questions or comments about this article, please join us to discuss them on the Forum here. Catch up on the previous article in the series - Mastering MODX: Super Knob Common.